Uncategorized | Kitty City Salon Inc.
Recognizing irregular behavior is one of the most common methods pet owners use to determine if their cat may be sick or in pain. One behavior that should be closely regulated is urinary behavior. Keeping track of urination habits helps prevent conditions such as feline lower urinary tract disease (FLUTD), an umbrella term that refers to disorders affecting the bladder and urethra of cats. FLUTD includes many disorders, including urinary tract infections, bladder stones and feline interstitial cystitis (FIC), a complicated disorder that causes cats to show signs of bladder inflammation though they do not have a bladder infection. The cause of FIC is not completely understood, but signs of FIC are often precipitated by stressful events. Risk factors for FIC in cats include being overweight, being an indoor-only cat, and experiencing stress. Treatments for FLUTD vary based on the cat’s condition. For example, a life-threatening situation caused by a urethral obstruction would require stabilization of the cat and relieving the urethral obstruction via a catheter. For cats who have FIC but are not blocked, clinical signs often resolve after three to seven days. However, pain medications are often needed as this condition can be painful for the cat. Many over-the-counter pain medications are not safe for cats, so pain medications should be prescribed by a veterinarian. Preventing the conditions that contribute to FLUTD is important for your cat’s health. If you see any changes in your cat’s urinary behavior, be sure to consult your veterinarian. Hairballs are a natural part of your cat’s fastidious grooming routine, but that doesn’t mean you love cleaning them up! To help with the woes of hairball control we’ve selected products to reduce their frequency, as well as cleaning products for when the inevitable happens. One of the best ways to cope with hairballs is to reduce their frequency. With Wellness’ Hairball Control formula you not only nourish your cat, but also help move hairballs through their digestive system (both hair and already formed hairballs). And getting your cat to eat it couldn’t be easier—enticing meat flavours will have them chomping at the bit! Hairball Control treats from Emerald Pet are a treat for you and your cat. Super tasty and shaped like fish (so you know your cat will devour ’em), they also promote digestive health and reduce hairball growth. In other words, less icky hairball messes for you to clean up and more happy cats! Along with preventing the formation of hairballs, this super tasty salmon paste supports healthy skin and coat. Your cat will eat it up and be left looking great! Feeding your cat hairball reducing formulas is a great preventative measure. Another useful solution is grooming products that remove excess and loose hair, like the Furminator. Its stainless steel edge reaches deep beneath your cat’s long topcoat to gently remove undercoat and loose hair—purrfect! Regular brushing combined with a hairball control shampoo is your ultimate defense against hairballs! This natural Oatmeal shampoo from Oster is safe on your pet and contains a cleansing aloe to soothe your furry friend. Despite your best efforts, even with the help of these fabulous products hairballs can still happen. On those rare occassions, Simple Solution’s Stain and Odour Remover cleans up the mess with a pet-safe blend of pro-bacteria and enzymes that doesn’t mask odours, but works quickly to neutralize them. Hairballs might not be pretty, but dealing with them is a lot less tedious with these problem-solving products! 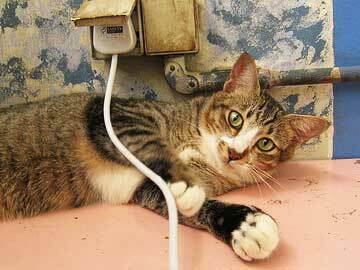 Keep cords out of kitty’s reach to help curb her penchant for chewing them. Q. My cat, Jane, has chewed through every one of my electrical cords. She has chewed through my Internet cord, my television cord and my vacuum cord. I brush her teeth, she eats soft and hard food and has a chew toy that she occasionally uses instead of electrical cords, but I’m still finding chewed electrical cords. My other concern is that she will electrocute herself. How can I stop her before she uses up her nine lives? A. It sounds like Jane has a penchant for a shocking habit! She is obviously not doing this because she thinks that it will improve her oral health, rather it is something fun. Such chewing is common with rabbits, as they simply love to chew cords. In either case, the recommendations are the same: Avoidance is the best, and then working to counter condition the pet is also helpful. Suggestions for avoidance include placing all cords out of reach up over doors, windows, and covering the cords where they are in reach and where they plug into the wall. Many people use PVC pipe or plastic shower rod covers for color coordination to hide and camouflage all electrical cords. Behavioral modification can include giving your cat allowable cord-like toys to play with, however, be sure to praise them for playing with her new toys instead of fatal cords. Also, rubbing catnip on the good toys and a bitter-citrus deterrent on the bad cords may help. Be sure to rotate toys frequently and give your kitty other toys such as boxes, paper bags with no handles, tunnels and other chew toys to keep her busy. In rare circumstances pharmacological intervention (generally for obsessive-compulsive disorder) may be needed, but the services of a board-certified behaviorist is recommended before beginning any form of drug therapy. By understanding your kitten’s penchant for play, you can create and interesting and simulating environment for your pet. A kitten has few characteristics more captivating than its playfulness. Watch any kitten, or group of kittens, and you’re sure to see some serious fun rolling, racing, chasing, pouncing, batting, leaping nonstop, at high speeds like a streak of lightning through your living room, up the stairs, down the stairs and into the kitchen. Yes, watching kittens play is a kick. However, there is a slightly serious side. Physically, play strengthens muscles, develops eye-paw coordination and keeps kittens fit, toned and at a proper weight. The definitive answer as to why kittens play is still pending. However, researchers speculate that play is the way kittens experiment with normal, adult, feline behaviors such as hunting, social interaction, sexual behaviors and evading predators. There are two primary types of kitten play: object play and social play. Initially, kittens engage in group or social play and, as they develop, progress toward solitary, object play. Patrick Melese, DVM, a veterinarian in Rancho Santa Fe, Calif., said that social play which involves chasing, rolling, pouncing, and leaping starts at about 3 weeks of age with gentle pawing and progresses to biting. It peaks by about 12 weeks of age, then declines toward week 16 when there seems to be less desire for social contact with other cats. Initially, social play involves multiple kittens (three or more), but after 8 weeks of age most social play is between pairs. As adults, not all cats will play socially. Object play looks similar, but involves an individual kitten chasing an inanimate object, such as a ping-pong ball. Object play increases at around 7 to 8 weeks of age and tends to continue into adulthood. “Object play predominates by 16 weeks but by 19 to 20 weeks, object play actually doubles in males compared to females of the same age,” Schwartz said. Interestingly, male and female kittens tend to play differently. According to Schwartz, males are more likely to engage in object play. “Females tend to be more tolerant of group situations, so they may be more prone to group play. Toys are a great way to support your kitten’s need for stimulating play. It is best to try different types to determine which kind your kitten prefers. “Every cat has a tendency to like one toy over another,” Schwartz said. Kitten owners should consider their individual cat’s personality and figure out what might be stimulating and interesting to the cat. “If we want our kitty cats to have environmental and social stimulation, it behooves us to think about what we want to do this week for our kitty cat,” Virga said. Virga suggests creating a chest filled with a variety of toys. Keep the chest hidden and rotate the toys in and out of your kitten’s play routine, so the kitten is less likely to get bored. He also suggests shopping for toys that offer different visual, auditory, tactual and olfactory stimulation. Also, keep playtime safe and hazard-free. Be aware that there are toys on the market that are potentially dangerous. “Not all of them are safe,” Schwartz said. Avoid toys with parts that could be swallowed, such as small bells, ribbons, twine, and rubber bands. Check toys for sharp edges that could poke, prick or cut. Toys should be too large for your kitten to swallow, and nontoxic if accidentally ingested. “Kittens should not be allowed to play with plastic bags or aluminum foil,” said veterinary behaviorist Lynne Seibert, DVM, clinical resident at the University of Georgia Animal Behavior Service. Remember to observe your kitten’s play, and be wary of any possible dangers. “Supervise your kitten with any new toy,” Seibert said. It is important for kitten owners to protect themselves from little claws and teeth. Young kittens do not usually inflict much damage, but serious injuries can occur when they grow and continue to attack their owner’s body in play. To prevent overly exuberant or inappropriate play, use toys that keep the object of play at some distance from the human body. Prevent the kitten from learning to target hands or feet. And, do not play games that tease or frustrate the cat. To better understand your kitten’s world view, Virga encourages owners of indoor cats to think about what it might be like to stay indoors for several weeks. With little change in the environment or stimulation of some kind, “cabin fever” is sure to develop. 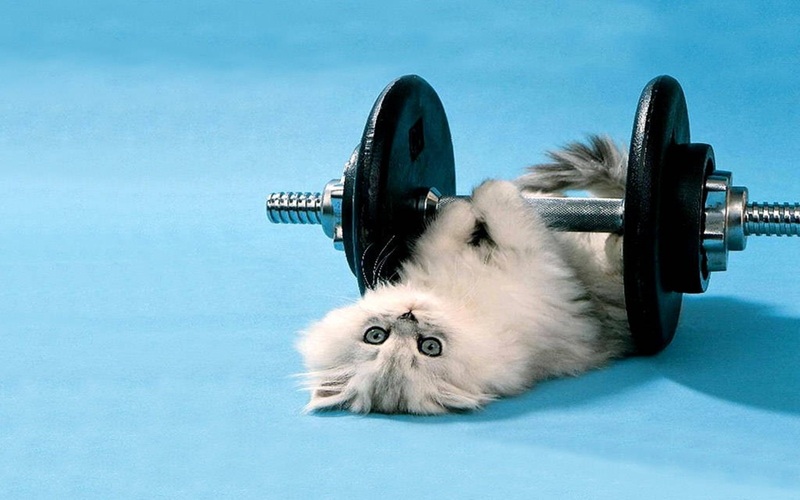 Cat Exercises: Regular exercise can benefit your cat. 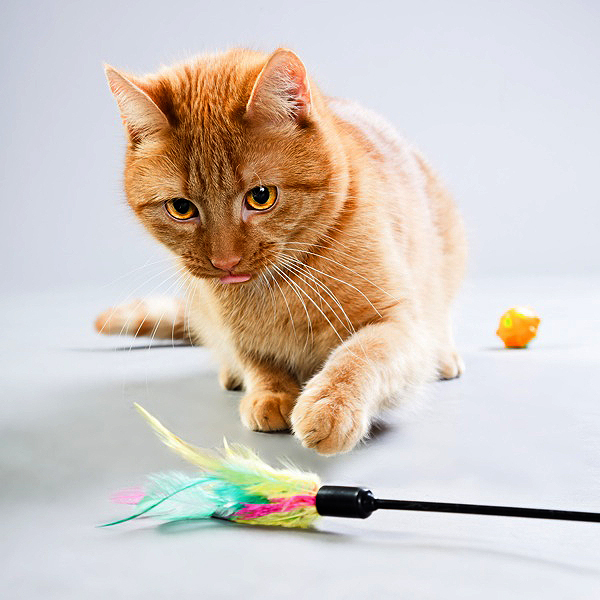 Try one of these eight ideas to enliven your cat’s playtime. 1. Use an interactive toy with feathers on the end. Move it like a bird to encourage your cat to leap and stretch. 2. Slither snakelike toys up and down stairs. These toys are also great for going up and over the tops of sofas. 3. Set up boxes, bags and soft-sided tunnels to create an obstacle course for your interactive exercise session. If you can’t find the soft-sided tunnels, make tunnels of your own by turning boxes upside down and cutting entrance and exit holes. 4. A small ball in a box works as a mini racquetball court. 5. Use your interactive toy around a tall, sturdy scratching post to encourage your cat to scratch. This causes a full stretch, which helps tone the muscles in the shoulders and back. 6. Invest in a multi-tiered cat tree so your cat can jump from one perch to the other during play. This exercise improves balance and coordination. 7. Plastic caps from milk jugs make great hockey pucks. Drop one on the kitchen floor to work on your cat’s speed and coordination. 8. Don’t forget to laugh. I will do wonders for you emotionally and physically. Your cat will pick up on your good mood and everyone will have a good time. CatChannel expert Jeanne Adlon, professional cat sitter, discusses tips for having cats when you have a cat allergy. Q: I have just been told I am allergic to cats but I am not giving up my two adorable cats. Any suggestions to help me keep my allergy under control? A: I do have suggestions for you because many of my clients ask me the same thing. No one wants to give up their cats and I am so glad you agree. One of my clients lets her two cats have the run of the house — except for her bedroom. She has designated it a cat-free zone which she considers it a small price to pay to keep her feline family together. Her cats have their own cozy donut beds by the radiator in another room. 1. Wash your hands after petting your cat and before you touch your face or eyes. 2. Wear a filter mask when cleaning the litterbox. 3. Limit the amount of cats in your household. 4. Do not let your cats sleep with you. 5. Spay or neuter your cats. Unaltered cats produce more allergens than altered cats. 6. Limit the amount of carpeting in your house. 7. Use a vacuum with a good Hepa filter and wear a filter mask when you vacuum. 8. Buy dust-free cat litter. 9. Use allergen-proof covers on your mattress. 10. Consult an allergist for further suggestions. Good luck. I know many people who have been diagnosed with cat allergies who successfully have cats. As always, I welcome your comments and stories. Your pet’s teeth need daily attention, just as yours do. Dental problems are some of the most common diseases seen in cats. Cats often hide their oral discomfort, but occasionally, a cat may reveal its pain by pawing at its mouth, drooling or turning its head to one side while eating, to avoid chewing on the painful side of its mouth. Some cats stop eating because of dental pain. Others may stop eating dry food and only eat wet food. Kittens are born without teeth. Baby teeth begin to appear in the first two weeks. At 6 weeks of age, all 26 of your kitten’s baby teeth should be present. By 6 months of age, 30 adult teeth replace your kitten’s baby teeth. The 30 teeth include 12 little incisors in front, four canine teeth (the two upper and two lower fangs), 10 pre-molars and four molars. Periodontal disease, or gum disease, commonly affects cats. This disease is caused by plaque the sticky, bacteria-laden coating on the tooth surface and the body’s response to those bacteria and the toxins they release. Oral bacteria can enter the bloodstream through diseased oral tissues, affecting other organs, such as the heart valves and kidneys. As the immune system responds to the plaque, the gums become inflamed. This is the first phase of periodontal disease: gingivitis. Left untreated, the inflammation progresses and the second phase of periodontal disease (periodontitis) occurs, and may cause receding gums, bone loss and periodontal ligament damage. If not removed, the plaque mineralizes into tartar or calculus within days and requires mechanical removal. Fortunately, the first stage (gingivitis) is reversible if your cat receives a professional cleaning and if you institute a home care program. Periodontitis, however, is irreversible. The early stages are characterized by gingivitis and halitosis (bad breath). Up to 80 percent of cats 3 years of age and older suffer from gingivitis. You must alert your veterinarian to the red flags of gingivitis and begin professional cleaning, in some cases, between 6 months and 1 year of age. Daily home care is essential. Brushing your cat’s teeth can help prevent dental disease. Within only a few days of a professional dental cleaning, plaque is already building up on your cat’s teeth. The ultimate goal of home care is to remove plaque before it becomes calculus. Introduce home dental care during kittenhood, so cats become used to having their lips lifted, their mouth and gums touched and handled, and their teeth brushed. Owners of older cats may still institute home care, but it depends largely on the cat’s nature. A compliant cat will likely allow home dental care despite the late introduction. Introduce your adult cat in the same way you would introduce a kitten – gradually. Get your cat used to having its lips lifted and its teeth and gums touched. Then add toothpaste. Next, try toothpaste with the brush. If you have difficulty with a traditional pet toothbrush, try a finger brush, a plastic cap with nubs that slips over your finger. Choose a cat-specific enzymatic toothpaste to apply to the brush and gently brush your cat’s teeth and gums. Never use human toothpaste; cat-specific toothpastes are formulated for feline tastes and include flavors such as poultry, beef, seafood and malt. Many cats tolerate the procedure, albeit reluctantly. Brushing every day is ideal, but for difficult cats, brushing two or three times a week is satisfactory. If your cat will not tolerate tooth brushing, there are many other feline dental hygiene products available, such as gels, oral rinses and sprays. A cat that will not tolerate any oral manipulation needs regular dental checkups at least every four to six months. Dental diets are a more recent veterinary development. These diets are designed to prevent or dramatically slow the accumulation of tartar on the teeth. They do not replace home care and they may be inappropriate for cats with advanced periodontitis, because the hard kibbles can irritate the gums. Many cats like tartar-control treats. If you regularly offer your cat treats, consider using crunchy, tartar-control treats instead of the softer versions. Remember that by taking regular care of your cat’s teeth, you are caring for its overall health. 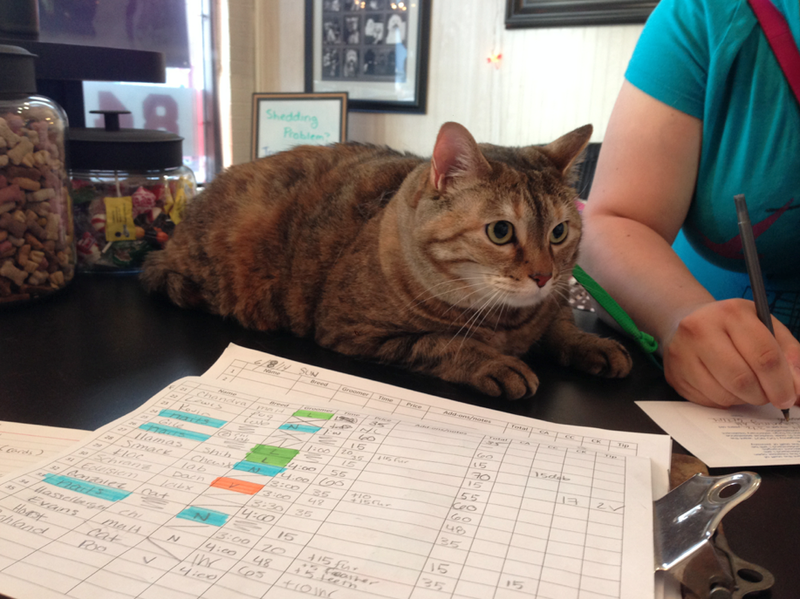 Here she is checking in for her first makeover at Kitty City!